Yesterday I mustered up the energy to tape the Astoria together. I’m not sure if it was the pattern or the fact that I had take a bunch of cold medicine, but I actually had to use the “guide” to help me put this one together. 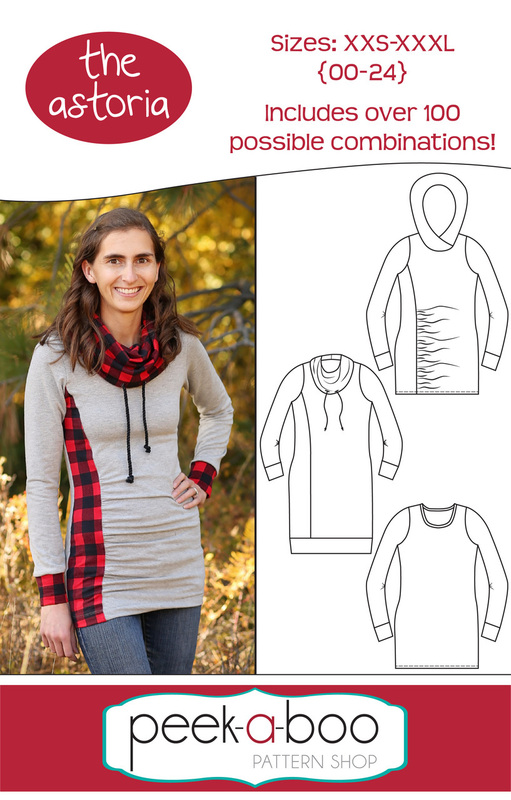 I will give this pattern one thing, it has tons of options: besides the length, there is a standard, cowl, and hoodie neckline, a variety of sleeve lengths, a standard and ruched bodice, as well as a fitted and looser fit. This entry was posted in Uncategorized on November 7, 2018 by stacy. Proof that winter is right around the corner… we got sick. I had such plans this weekend to accomplish so much, but I just haven’t had it in me to work on anything. Yesterday I did manage to finish up two large projects for Creative Machine Embroidery – I had wanted to show you a sneak peek, but it wound up being too obvious what it was so I scrapped it for this meme instead…. because I think we can all relate! Speaking of patterns, I recently picked up Peek-a-boo Pattern’s Astoria with the intention of making the same top that Amy is wearing on the cover photo…. then decided that I needed it in black and plaid, with a hood instead. Since I’m still a bit out of commission, I think putting that pattern together will be my main objective today – I’m risking mucking up the whole thing if I try to sew it (I tend to make a lot of mistakes if I’m sick, anyone else?). I am also seriously behind on Seamwork, but I do love the new Elli – I’m definitely putting this one on my list. The Francis is pretty cute, too, but I’m 99% sure that I’ll wear it once and then it’ll sit in the closet. This entry was posted in Uncategorized on November 6, 2018 by stacy. If you follow my Instagram, the photos I’m about to show you aren’t really much of a surprise. First up, Halloween! 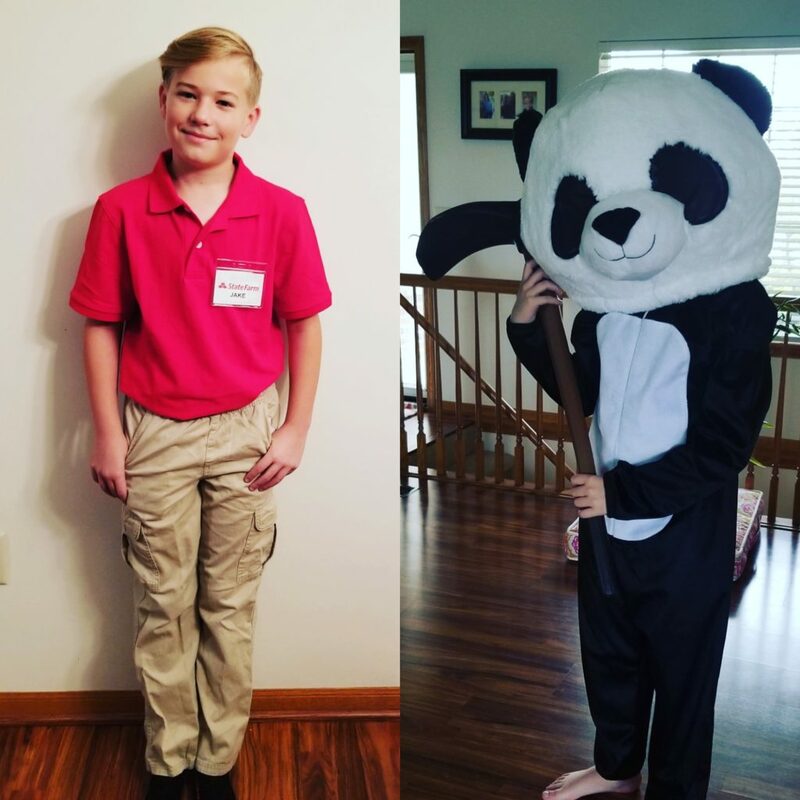 This year, Easton has picked Fortnite’s Panda Team Leader (you can read about the Inspiration, costume info, and accessories in these posts). In a surprise turn of events, Easton’s school let the kids wear their costumes all day – but between the weight and awkwardness of the back bling and the giant head (I am 99% sure it wouldn’t even fit in his locker) and how hot the suit was, we determined that this costume wasn’t going to work very well at school… so we opted for something easy: Jake from State Farm. It was quick and easy and we both thought it was silly. So what else do I have to show off? My Sister Imperator dress… at least part of it. I worked up the nerve to wear it to our concert last week. I figured it would sit in my closet otherwise and this was the perfect event to wear it to since it was inspired by the band’s most recent video AND lots of people “dress up” at their show anyway. I wound up altering the neckline some from my original garment so that it looked a bit ore like the inspiration and stayed up a lot better (not to mention the fact that I could wear a regular bra). 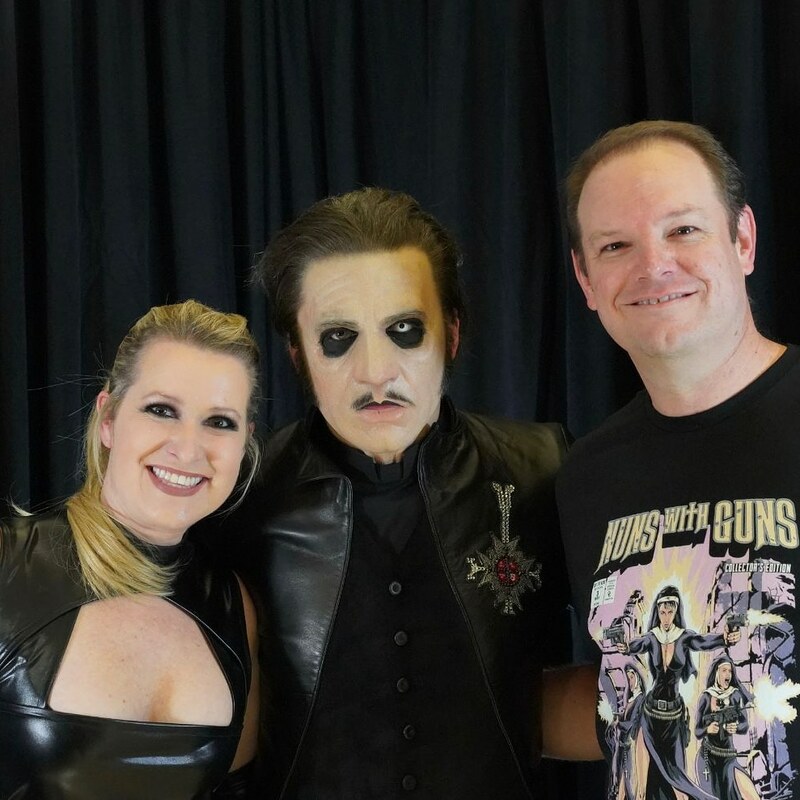 We did a meet & greet so here’s our shot of us with the lead singer (and if you’re wondering he does wear a mask). This entry was posted in Uncategorized on November 2, 2018 by stacy. This embroidered velvet hoodie may be my next project. I’m pretty sure it’s love. (The tutorial includes the hoodie pattern, this tutorial shows you how to add the embroidery patches… you don’t even need to own an embroidery machine to do this!). If it’s time to replace your ironing board cover, you’ll definitely want to check this tutorial out – it has pockets! While you’re there, be sure to enter in her contest to win a $30 gift certificate to the Fabric Fairy. Nothing says fall like flannel. Make yourself a new purse with this flannel and leather tote tutorial. I must be in the mood for dresses because a lot of (free) patterns and tutorials caught my eye today – like this easy shift dress, a Chanel style frock, and this fun Little Black Dress. Not in the mood for a dress? How about an easy circle skirt? This one looks like it would be fabulous to twirl in, too. Christmas is 54 days! Kick off your gift sewing by making a few of these gift totes – in small, medium, and large sizes. The holidays are rapidly approaching (seriously, where did October go?) and if visiting family and friends are in your plans, you’ll definitely want to sew up a few of these packing cubes to keep yourself organized. It definitely feels like fall around here so it’s time to crack out the sweater knits and sew up a Hooded Cardigan (with pockets!). Yesterday I mentioned I was starting a new, v-neck tee pattern. Today I find a free one. Add some sparkle to your holiday season and sew yourself up a maxi skirt. Then use any of your leftover scraps to make this fun mermaid pillow. This ruffle hem skirt (for girls) is a great way to use that ruffle foot that’s been sitting in your machine’s accessory pile. This entry was posted in Uncategorized on November 1, 2018 by stacy.